Dentistry is a rewarding field for Dr. Matt Norman, who enjoys meeting and forming relationships with his patients. Providing care that truly makes a difference in the lives of his patients was a major influencer in pursuing a career in dentistry for Dr. Norman. 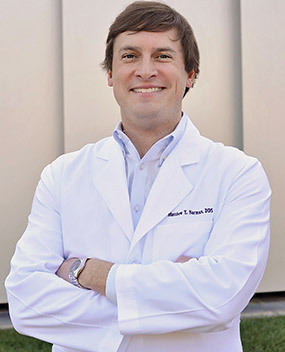 Dr. Norman joined his father’s private practice after he earned his dental degree from the University of North Carolina at Chapel Hill in June 2010. In 2017, he ventured into another family partnership with his brother-in-law, Dr. Dean Woodall, here at Raleigh Dental Excellence. Providing the best dental care possible is of the highest importance to the doctors at Raleigh Dental Excellence. Dr. Norman is committed to expanding his clinical knowledge and skills through continuing education, along with learning about and utilizing the latest technologies in his practice. Dr. Norman and his wife Chandler have one son. When he isn’t at practicing dentistry, Dr. Norman enjoys spending time with his family and friends, attending Carolina Hurricanes hockey games, and traveling.